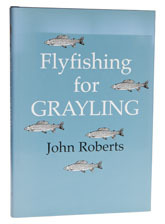 John Roberts is well known for his interest in grayling and in particular for his book The Grayling Angler, which was published in 1982 by Witherby and which deservedly went on to become a much collected work despite unexpectedly disappointing early sales. Much water has gone under the bridge in the last seventeen years; this new work is by no means a second edition of The Grayling Angler, since it omits any mention of bait fishing and concentrates purely on the fly. The author debates the pros and cons of the narrowed focus in the first chapter and one has to respect his decision, but the book definitely loses something in the process. The first 42 pages are devoted to a discussion of the grayling itself, which should be compulsory reading for all grayling anglers. The generally high feeding intensity of grayling and that fish with stomachs less than one-third full are rare explains why grayling shoals can be so suicidal at times; but the fact that the vast majority of their diet is composed of caddis should change the contents of a few fly boxes. The last third of the book is devoted to grayling patterns and while there is nothing terribly radical in it, it does give prominence to the best of the ‘new’ breed of flies including the Klinkhamer Special, which no grayling angler should be without.